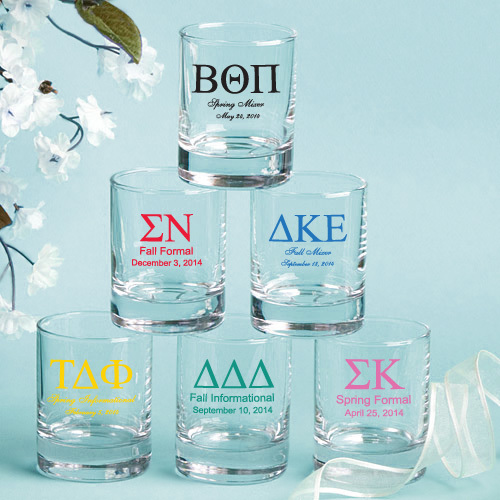 For Unique Greek Wedding or Party Favors with personal appeal, give these personalized shot glasses/votive candle holders a shot Whether you choose to use them as shot glasses or as decorative votive candle holders, these favors are guaranteed to shine! Each favor measures 2.5 tall x 2 in diameter, with a 3.5 ounce capacity, in a classic shot glass/votive holder shape with a thick glass base. Made in the USA, each is made of clear glass and they are perfectly fitted to be silk screened with amazing accuracy directly on the glass in a wide variety of all occasion themes, designs, colors and titles that match your theme and your personal preferences. A versatile and attractive choice, these personalized cordial/shot glass favors come bulk packed. Please allow two weeks for silk screening and processing as well as transit time for shipping to your location.